Previous post: Focus, honey, focus! Those with long memories may recall that Sandra Rude’s husband Mike was kind enough to make me an adapter so I could wind cones on my double-ended electric bobbin winder. Â However, he doesn’t do it commercially, and the adapter only works with one cone size, so when I saw the Magical Moons adapters – which handle multiple cone sizes in the same adapter – I just had to try it. Â And it works! Because there are many different sizes of groove (three, I think) it can adapt to most sizes of cones. Â I tried it out on the blue plastic cones that I have a zillion of, and it works great! Â I tried some of my other cones on it, and it seems to fit most sizes, though I’ve only actually used it with the blue plastic cones. 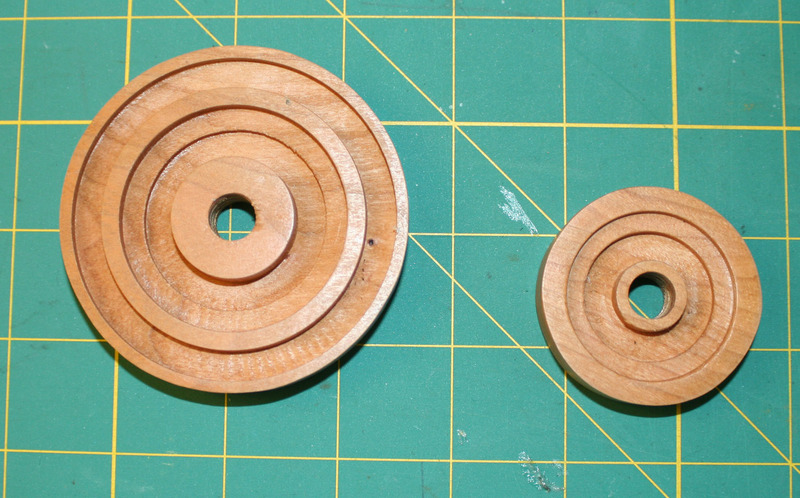 So, if you’ve been wanting to wind cones on your double-ended electric bobbin winder but weren’t lucky enough to know a woodworker, this is your chance. Â You can buy them in the Magical Moons Etsy shop -Â http://www.etsy.com/listing/98682339/cone-winder-adapter-for-the-bobbin . I should add that I had a minor problem with my adapter, stemming from the fact that one of my AVL bobbin-winder cones is damaged (I bought it that way used). Â I mentioned this to the folks at Magical Moons, and they were nice enough to send me out another set that fixed the problem. Â So I am very impressed by their customer service as well. Now, the katazome part: I have finished the katazome on the warp, a long process that required me to stencil on dye, let it react, then cover it with katazome paste, and apply more dye – three times! Â I washed it out yesterday, and wove up the first three motifs this morning. I don’t yet have photos of the woven cloth, but plan to finish weaving this evening and apply dyes tomorrow. Â Because the edges are substantially distorted (as tends to happen in painted/ikat warps of any type) it probably doesn’t make sense to stencil on images, so I’ll just paint them with thickened acid dyes (with or without katazome paste) let dry, and then steam them. All of which means that the Celtic Braid Coat is not yet done – the katazome experiments are just so much more exciting that I will likely finish them first! Â But that should only take a day or two, as I’m making rapid progress. Thanks for the link to Magic Moons. Since they’re in DC and I’m across the river in Arlington, I’ve emailed them to see if I can negotiate and in-person transaction. Maybe I’ll bring my AVL bobbin winder along to make sure everything fits. BTW: I like your verification thingie better than most. Some are so obscure that I can’t read them with two relatively good eyes and a quite good monitor. It’s one thing to be sure you’re keeping out the bots; it’s quite another to keep out the humans at the same time. Thanks! I was a little hesitant about adding a captcha (verification thing) because I don’t like them on principle, but I was getting so many spam comments that I basically had to. Presto! Almost no spam.